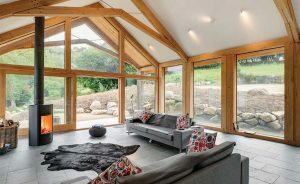 Considering extending your home with a timber frame? Timber is a readily available and easily adapted construction material ideal for building extensions. A timber-frame extension built using standard softwood panels filled with insulation can be finished to look no different to one constructed from blockwork, structural insulated panels or insulated concrete formwork, so aesthetics don’t have to be a consideration. ‘The exception to this is if the chosen timber-frame system is post and beam, in which some of the structural elements are left visible – typically upright posts, beams, ceiling joists, roof trusses and rafters,’ says experienced renovator Michael Holmes. It’s also possible to mix a post and beam structural frame with timber frame panels built around it as an airtight, insulated shell. Find out all you need to know about the practicalities of extending your home in our essential guide. What are the main types of Timber Frame Construction? The external sheet material is fixed to the softwood frames while the internal face is left open, ready for the electrics, plumbing and then insulation to be installed. Once this is done, the frame is closed up with plasterboard on the inside. This option is similar to open-panel systems, but with insulation fitted and channels and ducts already in place for the services – in some cases the services are already installed. Panels are typically delivered without doors and windows installed, but some manufacturers deliver panels with fully glazed external joinery in place.